Skinner Announces Strong Results for September 2014 Fine Jewelry Auction | Skinner Inc.
A private New England collection on the block to benefit Campaign for Catholic Schools brought in over $400,000 for the organization. Arts & Crafts jewelry from the collection proved to be desirable as three rare pieces of Arts & Crafts Tiffany jewelry inspired heated bidding. 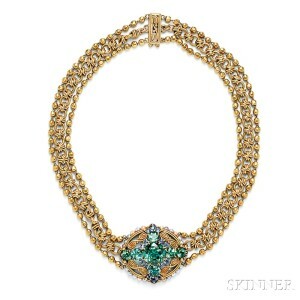 A standout from this trio – a stunning 18kt gold, tourmaline, and sapphire necklace – sold for $54,120. Further demonstrating excitement for fine Arts & Crafts pieces, the auction achieved excellent results for a superb collection from the descendants of Frank Gardner Hale, one of the most influential figures in the American Arts & Crafts movement. The collection contained 33 lots of rare plaques, panels, jewelry and more. An important archive, encompassing Hale’s designs, photographs, notes and models of his works featured among the auction’s top-selling lots, fetching $34,440 and smashing its pre-sale estimate by thousands. More than tripling its high estimate, an Art Deco Tiffany & Co. Kashmir sapphire ring, set with a cushion-cut sapphire, mounted in platinum and gold, sold for $116,850, emerging as the auction’s top lot. 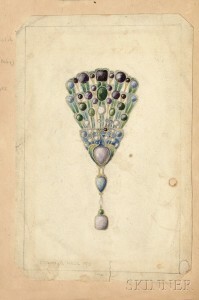 Also drawing excitement from bidders was a rare, early .830 silver and labradorite necklace by Georg Jensen, which brought $20,910. This entry was posted in News and tagged Arts & Crafts, auction results, benefit auction, Cartier, Fine Jewelry, Frank Gardner Hale, jewelry auction, sapphire, signed jewelry, The Campaign for Catholic Schools, Tiffany, tourmaline, Van Cleef & Arpels by Skinner. Bookmark the permalink.